Our communities are facing challenges like never before. Challenges like putting food on tables, roofs over heads, ensuring there is clean water to drink, and programs to support those who it need it most. It is no longer enough to just work a job. We need businesses and places within organizations where people’s ideas on how to solve these challenges are allowed to contribute, grow and flourish. 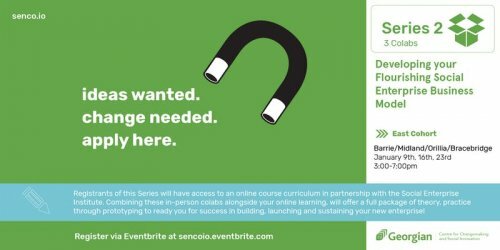 Let us at SENCO and Georgian’s Centre For Changemaking and Social Innovation help you or your organization take the first step to building out a Flourishing Social Enterprise. Using the Flourishing Social EnterpriseTM canvas as our starting point, we will put together the tools you need to kick-start your initiative. These sessions will work you through a prototyping loop to make sure you are testing your idea before ‘going live’. Successful prototyping unlocks access to additional community support including resource dollars. This ticket is for the full series which includes 3 Colab Sessions on January 9th, 16th, 23rd from 3-7pm. Session will be held at Georgian Campuses and location will be based on registration across the East campuses of Barrie/Midland/Orillia/Bracebridge.